You can find doggy beds for your poodle in the size and shape you like. If you want a bed for your puppy, it's best to buy a cheap one or discount dog beds. Puppies have potty accidents and chew, so a cheaper bed is fine for puppies. 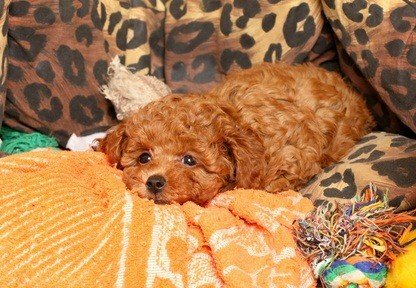 Be careful when selecting french poodle bedding for a puppy. Make sure there is nothing in or on the bed your puppy could chew that could cause him to choke or cause other health issues. If you are not having him sleep in a crate, you can put some blankets or towels down as a temporary bed. Towels can be washed easily if he has an accident. Make sure the bed you choose allows him to fit his entire body comfortably into it. You can buy bed pads of various thicknesses so choose which one you think will be the most comfortable for him. Some doggie beds come with pillows or the bed pad has a pillow built in one end. If not you may want to buy a doggie pillow for his bed. Poodles want comfort when they sleep like we do! Beds for dogs come in a variety of shapes and sizes. 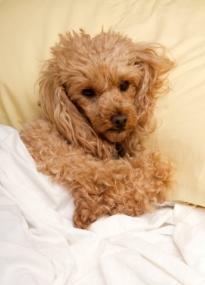 You can buy your poodle a heated pet bed, memory foam dog bed, orthopedic dog beds and luxury pet beds. If your pooch loves the corner to sleep or nap in, like Holly did, there are beds that fit right into the corner. We had an old afghan I made and a blanket in one corner of our kitchen for Holly. That was her place to go when she needed time alone or to nap. Be sure to get a mattress pad with a removable cover so it can be washed as needed. Your poodle will thank you! Doggie beds can be as simple or elaborate as you would like them to be. Poodles just need a warm, comfortable place to sleep that is their's alone.